Posted on October 15, 2013 - Get free updates of new posts here. Remarketing has grown in popularity in recent years, but has actually been around for approximately ten years with the term retargeting used initially. Remarketing is a type of marketing where you show your advertising only to people who have been to your website, landing page or those that have read your email marketing. This ensures they do not forget your brand and come back and convert when they are ready. Compared to standard banner or display advertising, the conversion rates and click through rates are far higher on remarketing campaigns and the cost per conversion in most cases makes it an integral part of any online marketing strategy. 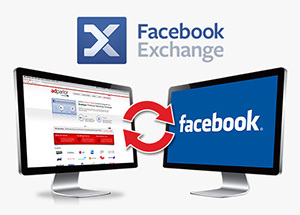 While Google Adwords have been the leading provider of remarketing to date, in June 2012 Facebook quietly introduced a remarketing solution known as Facebook Exchange (or FBX). This form of remarketing is delivering promising results and is only offered through selected partners presently. It is likely Facebook will introduce this as a standard option through their advertising dashboard in the future, however now is the chance to get the head start on your competitors and take advantage of Facebook remarketing. (EDIT: Facebook have now launched their own remarketing platform giving you the choice of using a partner such as Adroll or going direct to Facebook, more info here). To get started you need to sign up with one of Facebooks recommended partners. I have had experience with a number of them but strongly recommend you try Adroll at first as they have a simple setup, great support, no setup fees or contract and offer prepaid marketing options. Once you have signed up with Adroll (or another partner) the next step is to generate a remarketing code or pixel, take this code and place it on your website or landing page and then your audience will begin to build. Its a good idea to wait until you have around 500-1,000 people tagged in your remarketing pool before you get started, so the quicker you can get the tracking code on your site the better. Now that your remarketing audience is building you can create some ads to test. These ads come in a variety of formats and will display to a user after they have visited your website when they go on Facebook. Almost all bidding is on a CPM basis at the moment (pay per thousand views) with some providers offering CPC solutions for large budgets. Your ads will be in compeition with other Facebook ads including other companies remarketing ads, so what you have to pay per view to get your ads visible will depend on your competition and the click through rate your ads generate. One feature which may put Facebook ahead of other remarketing options is the viral aspect. If a viewer of your advert decides to like or share the ad the ad then becomes free advertising to that persons friends, and friends of friends similar to normal Facebook posts. This is the most prominent section of Facebook and retargeting in this area gains extremely high click through rates and enables social sharing. As you are paying per thousand impressions, a high CTR can generate extremely high ROIs with some studies showing a 197% increase in ROI when compared to Facebook ads on the right sidebar. Remarketing on the side of Facebook is a great way to drive conversions with the same rules of a captivating image which stands out to ensure a high click through rate. 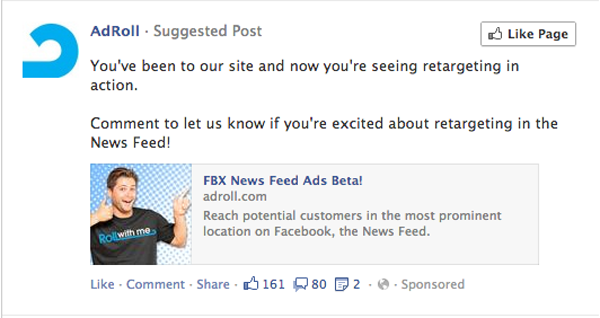 Suitable for eCommerce sites, and called LiquidAds by Adroll, these dynamic Facebook ads appear in the right sidebar. 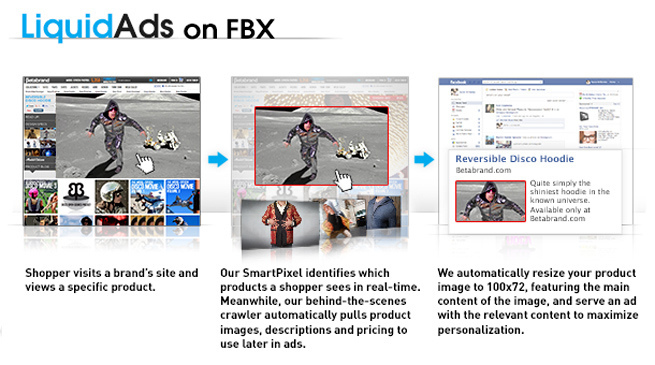 Ads are automatically generated with products that match the users browsing behaviour on your website. The ad creative is kept fresh automatically and the result is a 102% higher average CTR than standard sidebar remarketing. It is free to sign up for an Adroll account and generate a remarketing code so even if you are not ready to embark on this form of advertising yet, it is well worth installing the code on your site and starting to build an audience now.